A Working Paper produced by the Euro-Mediterranean Network of Economic Studies (EMNES), has concluded that, to date, there is unequivocal evidence the Euro-Mediterranean Partnership has failed to deliver on the promise of achieving shared prosperity through enhanced political association and economic integration. The Regional Integration in the Euro-Mediterranean Paper covers areas such as Euro-Mediterranean partnership, economic integration, trade policy and regional value chains. It draws on extensive evidence from academic literature on core dimensions of regional integration, its history and evaluates the current status quo in economic integration. All things considered, it indicates that there has been “very limited or non-existent catch-up between poorer and richer countries throughout the Euro-Mediterranean region”, the June 2017 Paper suggested. Several decades of Euro-Mediterranean cooperation hasn’t translated into regional integration, apart from limited progress in trade liberalisation. The lack of economic parity between richer and poorer countries across the Euro-Mediterranean region is hardly surprising, given the negative implications of the Great Recession and widespread instability in the aftermath of the Arab uprisings. The Paper provides readers with a wide-ranging view of the extent of the untapped potential for Euro-Mediterranean integration and prepares the ground for the formulation of policy recommendations on how to exploit this potential in the future. It notes that although the very nature of globalisation processes has changed in the last few decades – with a clear shift towards the predominance of global value chains – the approach to regionalisation in the Euro-Mediterranean hasn’t changed during the same period. It remains shallow, focussing on tariff waiving – rather than deeper integration – and is limited to non-existent harmonisation of processes and market conditions, which are all pre-requisites if regional value chains are to effectively emerge. Regional integration is being hampered by political tensions and further escalation of conflicts, exacerbating the dividing lines between the region’s countries, rather than building on their outstanding similarities, which are fundamental to prosperity. 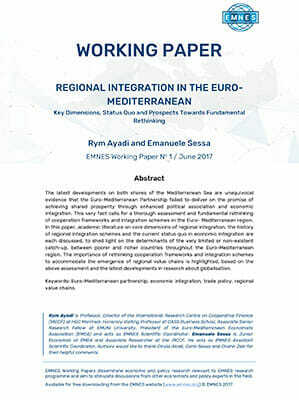 Indeed, the EMNES paper says that the prospects for regional integration in the Euro-Mediterranean aren’t as rosy as the “red transition” scenario anticipated by Ayadi and Sessa (2013), signalling further fragmentation and increasing distance between partner countries. Both Southern and Northern Mediterranean countries face persistent unemployment, in line with unprecedented worldwide youth unemployment rates. It is the lack of employment opportunities which seems to be the main driver for migrants, a large proportion of whom are migrating from Southern European countries. These migratory pressures, coupled with flows of refugees fleeing a number of conflicts, is fuelling scepticism in Southern Europe about the European Union project and is putting at risk any prospect of a more advanced integration scheme in the region and worldwide. EMNES has highlighted work by researchers and policy makers alike, to explain the employment crisis in Mediterranean countries. This is mainly due to a mismatch between the skills provided by education systems in the region and those required by labour markets (see also Ayadi and El Mahdi, 2013). A number of disruptive changes on the demand side of labour markets are also contributing to the challenges, mostly relating to two mega-trends – globalisation and automation-digitalisation. Referencing an insightful book on globalisation, Baldwin (2016) , the Paper identifies three types of drastic reduction in costs experienced in the past, or likely to be experienced in the future, as a result of unfolding technological advancements; costs of moving goods; costs of moving ideas; and costs of moving people, the first two having already undergone a drastic reduction. Baldwin distinguishes between “old” and “new” globalisation. “Old” globalisation refers to the decoupling of production and consumption induced by the drastic reduction of transportation costs, enabling a limited number of now rich countries, such as the United Kingdom, to concentrate their know-how, benefitting from lower wages in previously poor countries, such as China. This led to unprecedented wealth accumulation and a great divergence of income levels worldwide. “New” globalisation refers to the emergence of global value chains, induced by the reduction of communication costs that contributed to an unprecedented knowledge transfer within and between firms across the world. This has assisted a handful of poorer, yet industrialised countries, mainly in East Asia. Baldwin also provides evidence, however, that geographical proximity remains an important determinant of the emergence of global value chains, such as Germany and Poland. In light of this, it’s impossible to ignore why the Euro-Mediterranean region, with its mix of developed and developing countries and impressive complementary differentials in terms of know-how, wages, demography and resources, hasn’t seen the emergence of regional value chains. The Paper urges that further research should focus on the factors explaining the failure of the region to engage in mutually advantageous trade and investment relations. It points out that trade and investment agreements and related policies in the region, haven’t contributed to the emergence of regional value chains, echoing the argument of Baldwin (2016) that current policies fail to grasp the changing nature of globalisation. The EMNES authors advise that, in future, regional trade agreements and investment policies should aim to create the conditions for the emergence of regional value chains, based on potential or existing similarities between countries in the region, while industrial policies should seek to enhance access for domestic firms into these regional value chains. Likewise, education systems should be tailored to create resilient workers, focusing on the development of transversal skills that would be useful in multiple domains, rather than sector-specific skills. Also, vocational training programmes ought to focus on skills specific to given sectors. Alternatively, value chains should be mainstreamed alongside other lifelong learning institutions to accompany the retraining and redeployment of workers in rapidly changing labour markets, so that they benefit from the opportunities offered by these mega trends. The role of public-private partnerships would be central in tailoring and funding such vocational training programmes and lifelong learning institutions, the Paper says. The other mega-trend having huge implications on labour markets and the regional employment situation is automation-digitalisation. The Paper notes that many authors have discussed the job destructive potential of these two distinct, yet tightly related trends. Robots are progressively replacing humans in productive processes and digital platforms are abruptly replacing labour-intensive intermediaries in the market. In a rather grim picture of the future, the Paper observes that those workers whose productivity is replaced, rather than augmented, by technological advancements will see their wages shrink or their jobs disappear. On a more optimistic note, Baldwin (2016) discusses the repercussions for globalisation of the drastic reduction of face-to-face costs induced by innovations, such as telepresence and remote intelligence, meaning jobs no longer require a physical presence. As a result, cheaper workers in developing countries could provide services in developed countries – without actually moving there! If effectively harnessed with adequate policies at a regional level, such as the introduction of basic income schemes to compensate the increasing weight of capital in an automated-digitalised economy (see Reich, 2015), these developments might actually represent a solution to migratory pressures in the longer term. All things considered, the EMNES Working Paper points towards the need for more qualitatively different Euro-Mediterranean integration, aimed at the concerted establishment of common policies to counter disruptive influences. This vision echoes the “blue transition” scenario devised by Ayadi and Sessa (2013), where similarities between countries in the region were exploited, to turn a number of threats undermining stability in the region into opportunities for inclusive and sustainable co-development. Regional Integration in the Euro-Mediterranean was co-authored by Rym Ayadi, President of the Euro-Mediterranean Economists Association (EMEA) and acting EMNES Scientific Coordinator, along with Emanuele Sessa, Junior Economist at EMEA and EMNES Assistant Scientific Coordinator.